The Villa is located in one of the most beautiful areas of the island, on the the valley of Messara , where the highest mountains of Crete, Psiloretes, encounters the Libian sea at Pitsidia village. This villa is conveniently close to small shops, tavernas (Greek restaurants) and most, importantly , to beautiful landscapes and pristine sandy beaches that line are the southern coast of Crete . 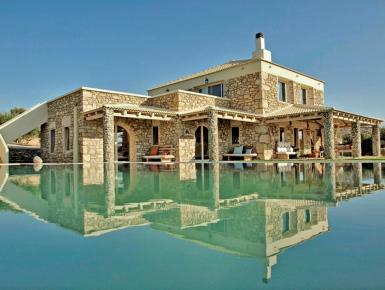 This luxurious villa is situated on the slopes of a small hill surrounded by an olive grove. It is in a sheltered location, where you feel like being secluded from other houses. It was built in 2010 in a modern style, combining both wood and stone, giving it an air of simplicity, warmth and modern luxury consisting of 270m² place.